Is Aldi really cheaper than Walmart? I went to both stores for the ultimate price comparison on over 85 items and I'm sharing it all on the blog today! I've been shopping at Aldi for over 15 years and at Walmart for as long as I can remember. I feel like both stores really have a lot of pros and cons (more on that in a future post) and recently decided to narrow down exactly how different they are in pricing. My family and I are doing the Whole30 for the month of January so our produce and meat prices needed some special attention. I like to know if I'm getting the best deal when we're eating plenty of both at every single meal. Obviously, your shopping experience with the quality of each store may be different than mine so please keep that in mind while reading this post. I've been to both wonderful and terrible Walmart and Aldi locations. I've purchased wonderful fruit from one, terrible fruit in another, and vice versa. You just never know! There are so many details to take into consideration while going through this comparison. Lastly, many hours were put into this project. I put on comfy tennis shoes and walked around these stores with a giant legal pad, trying not to miss a single detail. Every effort was made to ensure accuracy in the making of this post. However, please expect that available items or prices may vary. With so many locations around the world, it's just bound to happen. 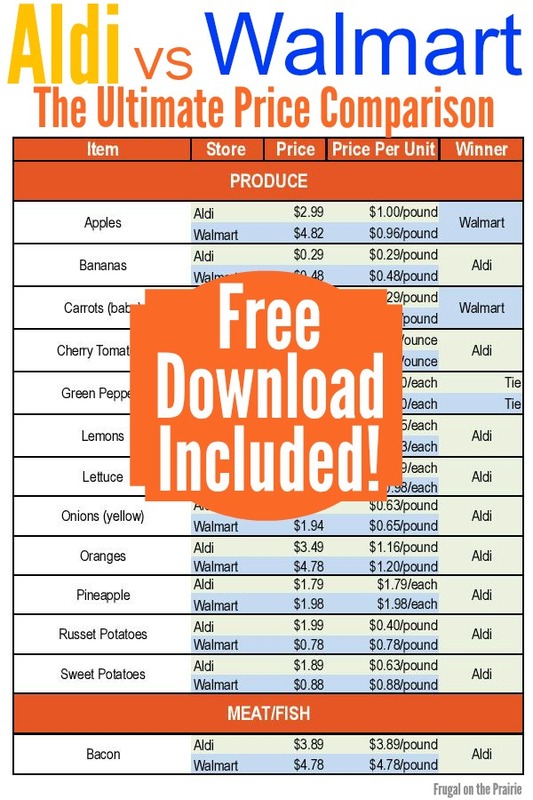 Click here or on the photo below to download the price comparison sheet. Conclusion: Is Aldi Cheaper than Walmart? Mostly yes, but not in every category! I really thought Aldi was going to blow Walmart out of the water on every single item. Obviously, it was far and away the winner all around. But it really failed in the meat prices, both frozen and fresh. Your savings may be dependent on what you and your family mostly eat. For example, Walmart was far and away more cheaper in the meat department. But if you don't typically eat meat, then Aldi would be a better choice if you're looking for one-stop shopping. Overall, I'm incredibly glad I was able to do this because I can print it out and easily compare my normal stores (Walmart & Aldi) to other sales in my area (Sam's, Costco, Target, Kroger, HEB, and so on). Do you shop at Aldi or Walmart? What do you like/dislike? I know I’m not alone. Every year I browse through holiday gift guides and find myself saying, “These items are great but some of them are a little pricey.” I want affordable gift ideas! Let’s keep your holiday shopping on a budget this year with my 30 Under $30 series. Today I’m rounding up 30 of the best gifts for kids, each of them with a relatively cheap price tag. P.S. One of the best ways to overcome the “I don’t know what to buy” syndrome is to keep track of gift ideas throughout the year. I record every little gift idea my husband mentions in my Notes app on the iPhone. If you didn’t do this, don’t panic. There’s always next year! Here are a few ideas to help you out in the meantime. *This post contains affiliate links. Please read my Disclaimer for more information. Every effort was made to ensure these prices were accurate and up to date, but please be aware that they may be subject to change. I know I’m not alone. Every year I browse through holiday gift guides and find myself saying, “These items are great but some of them are a little pricey.” I want affordable gift ideas! Let’s keep your holiday shopping on a budget this year with my 30 Under $30 series. Today I’m rounding up 30 of the best gifts for women, each of them with a relatively cheap price tag. What's on your wish list this year? I know I'm not alone. Every year I browse through holiday gift guides and find myself saying, "These items are great but some of them are a little pricey." I want affordable gift ideas! Let's keep your holiday shopping on a budget this year with my 30 Under $30 series. Today I'm rounding up 30 of the best gifts for men, each of them with a relatively cheap price tag. P.S. One of the best ways to overcome the "I don't know what to buy" syndrome is to keep track of gift ideas throughout the year. I record every little gift idea my husband mentions in my Notes app on the iPhone. If you didn't do this, don't panic. There's always next year! Here are a few ideas tohelp you out in the meantime. You and I want to get the BEST deals this holiday season and it looks like Amazon has got us covered! Hooray! Amazon has begun it's Countdown to Black Friday Deals Week sales. Just follow that link to get your fingers on the hottest deals and limited-time sales. New deals are added every single day until November 19! Some of these deals are available to Amazon's Prime members even earlier so be sure to sign up if you haven't already. The savings could more than pay for the Prime membership. And if you've never been a member before, you may be eligible for a free 30-day trial. I'm a fairly recent fan of online shopping. There's no carrying around a diaper bag or fighting the crowds. I can shop in my pajamas while my little one quietly plays or takes a nap. Last year, I did nearly all of my Christmas shopping online. It looks like this year will be the same! What is the best Black Friday deal you've ever found? I am banning myself from shopping at any Target location for the entire month of August. Let me be very clear in saying that there's nothing wrong with Target. In fact, the store is really wonderful and that's my problem. It's too enticing and I am too weak. In the last 365 days we've spent an average of $150/month at Target. This includes a fair mix of home decor, groceries, office supplies, clothing for my husband/son/myself, sporting goods, kitchenware, electronics, and books. I don't buy any of these categories exclusively at Target, but I certainly shop there more than my bank account would like me to. Each time I visit, I am so confident I won't buy anything that isn't on my list. I give myself a little pep talk about how strong I am and how I have explicit control over my money. And then something shiny catches my eye, like a gold stapler or coffee mug that says "I love you a latte!" And the Dollar Spot section is the worst (best?)! Panic takes over and I find myself saying, "It's all so cheap. Get one of everything!" I need to take a break from Target because I rarely purchase items I actually need. I can see my husband smiling and throwing up his hands in thanks to God as I say this. But I still have access to Wal-Mart and it's extensive selection of paper goods, groceries, and miscellaneous. I'm sure I'll find exactly what I need, even if it doesn't have that Target flair I love so much. We've really been making wiser financial decisions ever since we moved to Houston and Target has been the one "addiction" I just couldn't move past. Some women love to go to the mall. I love to go to Target. By eliminating this particular store from my budget, I am essentially eliminating my spending of "Allison's fun money." This is the only place I go to pick up a little something for myself. I'm literally drawing a blank as to where else I'd want to shop and that's a good thing! Going on a Target Ban is simultaneously difficult and easy for me. It's difficult because I love Target and easy because my wallet hates Target. Note: Hubby is not forced to go on this ban with me. If he enters Target I will watch him with jealousy and depression in my eyes, but I will NOT follow him in the store. I will avoid the temptation entirely! Have you ever gone on a shopping ban before? What helped you get through it without going crazy? Hooray! You or someone you know is getting married! Once the initial butterflies calm down and you start writing checks you’ll notice two things: (1) weddings can be really expensive and (2) honeymoons can be really expensive. Everyone will tell you it has to cost tens of thousands of dollars but I just don’t agree. Where there’s a will there’s a way to save money on your honeymoon! 1. Honeymoon in the right season. There’s always a “right season” when it comes to engagements and weddings. There’s a good time to buy the ring and even a good time book the honeymoon. Choosing the right season depends on your desired location. For example, hurricane season in the Caribbean runs from June to November and will likely be less busy. We honeymooned there in the middle of July. Thankfully, there were no hurricanes and it was a risk that paid off! If you’re date is flexible, try to avoid popular travel times for families and couples. Anything on or around spring break, summer months, Thanksgiving, or Christmas will probably be a little more expensive. Which one will cost more? A week in Niagara Falls or a week in Paris? Obviously, the trip to France would hurt your wallet a bit more so think twice about your honeymoon destination. If you’re content to travel domestically you could really save a lot of money! A roundtrip flight ticket to NYC or the Grand Canyon would be a fraction of a ticket to France. 3. Ask for a donation to your Honeymoon Fund. No really, people actually do this. We were recently invited to a wedding where the bride gave us the option to make monetary donations for their Royal Caribbean cruise. The site showed that other guests had already paid for cruise perks like a couples massage, romantic dinners, and complimentary alcoholic beverages. If you're not headed for the seas anytime soon just do a quick Google search to find independent honeymoon registries. I've heard that Honeyfund and GoFundMe are good places to start. 4. Cash in all your points. Use this opportunity to cash in on any airline, hotel, or credit card points you have. I've also heard of people opening a credit card to receive promotional points and then using those to fund a trip. I've never personally done this before but if you play your cards right it may actually work for you. We used cash back bonus points from our credit card to pay for a few hotel nights and receive a discount on the rate. We also used our debit card rewards to order an entire luggage set for free! It took some planning ahead of time but it definitely paid off and we still use that luggage to this day. 5. Get creative with your transportation. Be creative with your modes of transportation if you're not crunched for time. Don't pay for cabs if you can use the public bus or subway. Don't fly if it's cheaper to arrive by ship. For example, take a cab to and from the airport but purchase a bus or subway pass for everything in between. In our case, the cost of two roundtrip flight tickets to the Caribbean was the same as a 7 day cruise. And a cruise comes with the accommodations and food! We cared more about the location and less about the way we travelled so a'sailing away we did. 6. Compare all flight and hotel options. Never purchase without comparing prices from other sources. I live by this rule regardless of whether I'm shopping for a honeymoon or a pair of shoes. Don’t buy the first ticket with a major airline carrier when a smaller one might have a better price. The cheapest-looking hotel won't necessarily have the best price. Be patient and compare all of your options before you choose. It’s nice to kick back and relax while you're on vacation. “I want to cook every meal,” said no one ever while on their honeymoon. But eating out three times a day, every day, adds up very quickly! Try to do cold cuts or fresh fruit and veggies for at least one meal a day. At least you won’t be broke by the time you get back home. 8. Make it short but sweet. My coworker almost had a heart attack when she realized I didn’t want to come in to work the Monday following my wedding. While I think she lacked the viva la romance attitude I had at the time, she was right in thinking that honeymoons shouldn’t last forever. Make your honeymoon long enough to catch your breath and enjoy being newly married but short enough so you don't spend all of that wedding cash you just received. We saved money by traveling for most of our time off while spending the last few days in the quiet of our new home together. Always remember that you should only spend as much as you feel comfortable with on your honeymoon. There's no need to live up to the hype of someone else's $10,000 getaway. Use some or all of these ideas and you will definitely save money. A pretty view is nice but you've already got the most wonderful thing in the world with you and that's your new spouse! How do/did you save money on your honeymoon? Where did you go?